All across Texas, school districts are using their “strategic plan” to drive organizational transformation, to include new learning environments, new learning standards and assessments and new accountability for students and their teachers. The driving force behind this transformation currently, is the Texas Association of School Administrators (TASA) and their New Vision for Texas Public Education. Funded with your tax dollars and legal because Texas legislators passed SB1557. When we talk about the “Shift” in Education moving from an academic knowledge-based education of Opportunity- (Equal Opportunity) where children are taught to read well, write well, do math well and they know history, to an Education of “Equity”- (Equal Outcomes) based on Attitudes, Values, Beliefs, Behaviors and changing a child’s worldview, for the good of the community, that is a template to fundamentally change America. Texas has been leading the way. Using effective “Community Engagement” known as the Delphi technique in coordination with a strategic planning process school districts are creating a new system focused on the environment, learning standards, assessments and accountability of teachers, forcing them to implement the transformation. Interesting to note…… One of Coppell ISD’s school board members at the time was Bennett Ratliff. Son of Bill Ratliff former Lt. Governor and former state Senator, who has ties to Linda Darling Hammond, Obama’s education policy advisor. “Ratliff and Moses are continuing to swill from the education trough by forming a new organization called Raise Your Hand to pressure the people for more tax dollars for Texas’ public schools. Have these two gentlemen any credibility on the subject? Bennett’s brother is Thomas Ratliff , who I happen to have crossed paths with, not only once, but twice when he filed ethics charges against me. Both of which were rejected by the TEC. He charged that with the educating of parents I was doing, I should be registered as a paid lobbyist. My husband had to laugh at that one. He is still wondering when we are going to be reimbursed for money I have spent fighting this battle to protect our children. 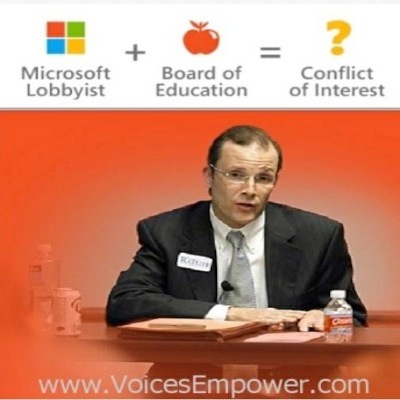 You see, Thomas Ratliff is not only on the Texas State Board of Education (SBOE) he is and has been for over 13 yrs a paid lobbyist for Microsoft. The same Microsoft whose owner Bill Gates gave TEA 7 million and TASA a 6.3 Million dollar grant with the stated Purpose: to provide superintendents and principals from public and private schools access to quality leadership development focused on technology integration and whole systems change. After Bennett Ratliff’s stint in Coppell ISD, (coincidentally his wife is a teacher in Coppell) he was elected as a Texas State Representative that the infamous Speaker of the House Joe Straus appointed to the Education Committee. Wow isn’t that a coincidence. Oh by the way the chair of the House Ed.Comm., Rep. Jimmy Don Aycock, has a daughter who was a lobbyist for Raise Your Hand as well. 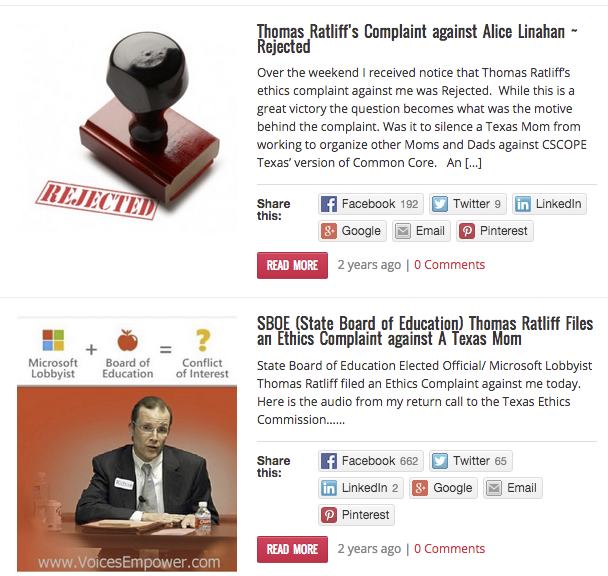 While we are talking about the family connections, it just so happens that Mike Moses mentioned above, his son is Mason Moses who runs the now rebranded CSCOPE called TEKS Resources Services for the 20 Education Service Centers who own the copyright to controversial Common Core like CSCOPE curriculum management system. Now that we have exposed who is leading the charge to “Fundamentally Change Texas Public Schools” and financially benefiting from that change. Let’s talk about what this is doing to Texas children, their economic future, and public schools in Texas and across the country. The Common Core National Standards and programs like CSCOPE in Texas are simply tactics, coordinating with legislation such HB 5 in Texas that set up the pathways to graduation and nationally the reauthorization of “No Child Left Behind” and WIOA (Workforce Innovation and Opportunity Act) which passed July 2014. Our children are seen merely as “Human Capital” for the government. Once you start to clearly understand the template to remold America, the puzzle begins to come together. It is a “restructuring” of American education from a K-12(Kindergarten through 12th grade) system of individual opportunity to a P-20 (Pre-school through College, Trade or Graduate School) system. This transformation moves American education to the Affective Domain, which means an education based on attitudes, values, beliefs, behaviors and changing our children’s worldview to a global perspective. As I have stated before the shift in education is NOT liberal vs conservative. Many liberals are horrified by what they are seeing in the classrooms. The fundamental shift in education we are talking about is changing from a transmission of knowledge, that parents still expect from our schools. When education is focused on how students perceive the world, that is known as critical theory or cultural marxism. Two great exposés that clearly show the affects of this emphasis in history and literature can be found in these two books by university professors, Keith Windschuttle ,The Killing of History and John Ellis’, Literature Lost: Social Agendas and the Corruption of the Humanities. The College Board’s SAT and AP (Advanced Placement) assessments and conceptual frameworks can be described as “Transdisiplinary” in their purpose. Transdisiplinary is when the function of the subject matter, concept themes in the syllabus, and course frameworks are all used to guide how a student views the world. The technical term most commonly used is lenses. Effectively these lenses become the values, attitudes, and beliefs the students are to be taking away from the curriculum. It is about equalizing and controlling the economy of America in the world. You are no longer that boy from Argyle, Texas who was a baseball star and a Boy Scout. You are now a global citizen. Not an AMERICAN. Nationalism is destroyed. That is why progressive republicans (Jeb Bush) are just as dangerous of progressive democrats (Hillary Clinton). The US Constitution becomes Null and Void. The goal to equalize America in the world is accomplished. This has been tried before, and it failed. 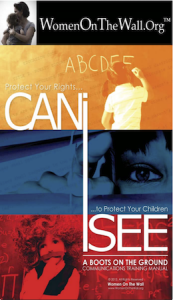 Failure to understand what’s been done to our children is risky business. You can’t stop them unless you understand what they’ve done and what they continue to do. Our children and their future is clearly in danger! Join the movement to stop the Fundamental Transformation in Education. 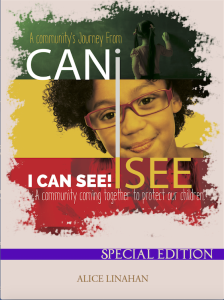 Help support “A Community’s Journey from #CANiSEE to I CAN SEE What You Are Teaching Our Children.